Writer-director Damien Chazelle's second feature, WHIPLASH, is a tour-de-force that's getting all the buzz at this year's London Film Festival and should, if there's any justice, clean up at Awards season. The lead performances from JK Simmons and Miles Teller (THE SPECTACULAR NOW) are astounding in their commitment and intensity - the photography and editing push forward the boundaries of how we capture the energy and intensity of live performance - and the score is just sensational. This movie works on so many levels - in front of and behind the lens - that I left the screening wanting to watch it again and really get under its skin beyond the initial reaction of just Wow. The movie is basically a two-hander between Teller and Simmons as music student Andrew and teacher Fletcher. Teller is at an elite music school and wants to be a legendary jazz drummer to the exclusion of all else. Simmons is the man to impress - his band the one to get into - but he runs that band as a dictator and cruelly abusive bully. The first hour of the movie sees Andrew punished mentally and physically, drowning his bleeding hands in ice water to practice to the level that'll impress the impossible to impress game-player Fletcher. This culminates in a set-piece so thrilling it could be in a David Fincher where each of them pushes each other to breaking point. In the final stretch we see the ultimate bait and switch that results in an on-stage concert that plays like a shoot em out between two obsessive characters. What's spectacular about this is that so much is communicated between the two of them merely by virtue of who's giving the other cues and recognition via the eyes and hand movements. The resulting movie is high octane, engrossing and memorable. JK Simmons' Fletcher has to be the most charismatic and quotable bully since The Thick Of It's Malcolm Tucker. And you have to admire Miles Teller's work in being able to play the virtuoso jazz pieces. One final point to make is that I watched this film with a friend who hates jazz but loved this film. You don't need to like jazz or indeed music to find this move compelling but if you do it'll add another layer of enjoyment to the experience. Teller and Simmons at the press conf yesterday. 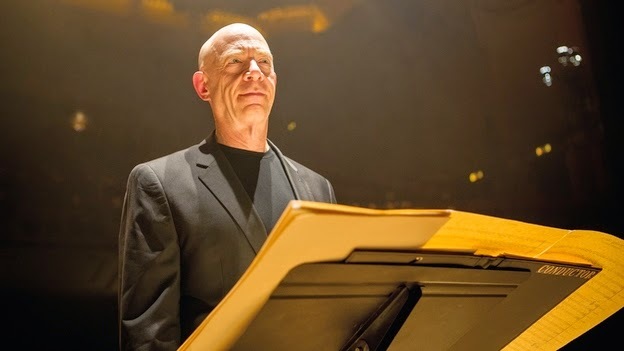 WHIPLASH has a running time of 106 minutes. The movie played Cannes, Sundance, where it won the Audience Award and Grand Jury Prize, and London 2014. It went on release in the USA last week and opens this week in Hong Kong. It opens in Australia and New Zealand on October 23rd, in Thailand on October 30th, in the Netherlands on November 13th, in Sweden on November 28th, in Norway and Romania on December 5th, in France on December 24th, in the UK on January 16th, in Poland on January 23rd, in the Czech Republic on January 29th, in Portugal on February 5th and in Germany and Denmark on February 19th.